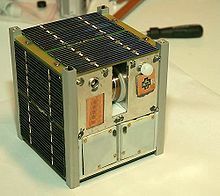 Cube shaped satellite, 100mm (3.9″) on a side. This photo shows the Norwegian student satellite NCUBE2 ready for shipment to the Netherlands for integration with the ESA student satellite SSETI-Express, photographer, Bjørn Pedersen, NTNU. National Defense is reporting that the Air Force is building two “Polar Scout” SAR satellites for the Coast Guard, expected to be launched this year. An earlier post referenced a Acquisitions Directorate report on this R&D Center project. These two satellites will only provide intermittent coverage of EPIRB signals from the polar regions so more satellites may follow. This appears to be first fruit of a growing cooperation between the Coast Guard’s R&D Center and the Air Force Research Laboratory which has been formalized by a recent Memorandum of Understanding (MOU) signed by the heads of the two organization on April 12, 2018. This entry was posted in Alaska, Antarctic, Arctic, SAR by Chuck Hill. Bookmark the permalink.